Q: What are your parent’s names? A: My parents are deceased, but their names are Bernard and Erzsbete. Which is the equivalent of Elizabeth. B-E-R-N-A-R-D. Fischl. F-I-S-C-H-L. And my mother’s name is E-R-Z-S-B-E-T-E. Her maiden name was Klein, K-L-E-I-N.
Q: What city and country were they born in? A: They were both born in Hungary. My father was born in a city called Vác, V-A-C. And my mother was born in which today is a part of Slovakia, a border area, which on many occasions belonged to Hungary or Czechoslovakia. Q: What are your mother’s and father’s birth dates? A: My father was born on October 16 or 17, 1907. And my mother was born on December 22, 1910. Q: Where were they raised? A: In Hungary. My father lived in that town until he got married, the town that he was born in, and my mother became an orphan at the age of 3. Her father was killed as a soldier in WWI, and her mother died a few months after that. I’m sorry… I think her mother died in childbirth. My mother ended up living with her grandparents. In the beginning they lived in a smaller village, but I think in the 1920s they moved to Miskolc, which is a major city in Hungary. Q: Where they raised in Jewish communities? A: Yes, they were. They were all observant, what we call today Orthodox. Q: What kind of schools did they attend? A: To the best of my knowledge, my father’s secular education was until maybe 6th grade, and his religious education was until the age of 19, elementary, secondary and advanced yeshiva education. My mother, probably something like that of my father. She must have done about 8 grades. That’s about my recollection. Q: How did your parents learn their Jewish customs and religion? A: Their parents were all observant Jews… it was a major factor in their lives. My grandfather died before I was born, but was a very strict religious person who raised his children to follow in his footsteps. And the same for my mother’s grandparents, they were very religious people… the minute observances of religion, they would observe. Q: What kinds of activities were your parents involved in before the war? A: My parents got married in 1937; they lived in Budapest after that. For a short time they lived in Miskolc for a couple of months maybe. And then they went to live in Budapest. My father was a traveling salesman; originally he was a salesman for Swvig, which is a major alcoholic drink manufacturer. After that, he worked in a family business of shirts and uniforms. Q: Do you know when they first noticed signs of anti-Semitism? A: As Jews they probably had anti-Semitism all their lives. The organization of anti-Semitism started the rise of Nazism, which in turn came into Hungary shortly after that. I don’t know if you’re aware, but there are numerous clauses where the Jews were restricted from certain professions because -according to the demographics- they had too many Jews in that profession… so, there was always unofficial anti-Semitism in Hungary, there always was. Q: What were your parents’ thoughts, feelings, and reactions regarding these changes? A: Well, as these things came about, the restrictions became worse. My father’s two brothers were taken into forced labor, in all practical purposes as slave laborers to the Hungarian Army. And he lost two of his brothers who were in Ukraine with the Hungarian Army doing very menial work, often very dangerous work. I don’t know exactly what they were doing, but many times these people were sent out to the front to be human shields, human people to activate mines if the opposing army mined their fields. These people were sent out and they were the human sacrifices. One of my father’s brothers, we don’t know what happened exactly but another one that was used as a human sacrifice, his family still got a notice from the Hungarian Red Cross stating that he fell in the war. Sarcastically the letter said, ”In the defense of the Motherland”, which wasn’t a fact. My father observed whatever was the date of his demise, and the other one we don’t have any definitive… obviously he succumbed to something. This was in 1941 when they were taken away. In general terms, to the best of my knowledge, many restrictive professions came about against the Jews, at certain times. A Jew could not employ a Gentile; a Jew could not have certain business, limited businesses, and eventually no businesses. By 1941, there were very restricted anti-Jewish laws which were enforced and which were in the books. It was really enforced and really done. And as I said, two of his [my father’s] brothers were taken and they perished. Q: How did the war affect your family’s cultural and religious traditions? A: My parents kept to their religion very strongly even in the worst of times. They tried to avoid, even in the Swedish Protectorate House. They did not eat anything that was definitively non-kosher. Obviously, they could not observe certain strict interpretation of kosher laws but as far as not eating pork… they did refrain from that, in the worst of times. They weren’t in the condition of starvation, but they were hungry. Q: How did your family manage to keep and continue their Religion during the war? There was, as far as I know, forced labor even in the Jewish community. But I don’t know… My father was working in Budapest in the Forced Jewish Labor Brigade at the Budapest Airport, which is called Ferihegy, the name of the major airport. He was working there, but he was able to come home on very frequent occasions. I never heard from him that as a policy he violated the Sabbath, even though according to Jewish law you are allowed to violate the Sabbath for the preservation of life. Q: What happened to your parents during the war? A: My father was first… I’m vague on that… but for some time my father was taken away. It must have been in the early 1940s. I believe it was to Yugoslavia, Serbia. He was there for… not a very extended amount of time, but some time. And then he was back in Budapest, and as I just mentioned before, at one time he was forced to work at the airport, where he was able to have a communication with his wife and he came home very frequently. That was until the occupation of Germany… Germany occupied Hungary, I believe in March 21st or 22nd of 1944. Q: And what happened to your mother and siblings during this time? A: They stayed in their apartment. Which turned out to be the ghetto, when the ghetto came into effect. When the Hungarians and Germans sent Jews into ghettos… our apartment was in that area. Q: When did your parents first hear of Raoul Wallenberg? A: I can’t answer that exactly. But, it was something… his legend was known. And my brother was born on October 16 of 1944, which was the date that [Miklós] Horthy was ousted by the Germans and the Nazi Nyilaskereszt [Arrow Cross] collaborators in Hungary. My father, who went to get my mother, but by that time she had already given birth on the street, while trying to get into a hospital or a medical center, not quite sure which one. After she gave birth on the street, they were able to get into an infirmary, or a hospital, whatever. They were there approximately 10 days or 2 weeks, and during those days the new regime in Hungary picked up most of the Jewish men and horded them… killed them. My father was not in that house, because he was with my mother in that so-called hospital. And, in a way, that was a survival for him. They came back, again my dates might not be perfect, but some time around the 30th they came back to their house… to their apartment. My sisters, who were 6 and 4 at the time, were being taken care of by neighbors. And the Gentile superintendent squealed to the Hungarian collaborators that there is still a Jewish man in the house. So they came to pick up my father. 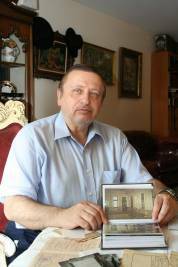 They came – one officer and two younger soldiers, and picked up my father and while they picked my father up they also found another Jewish person in that house. They took them to the SS Headquarters in Budapest. I think it was number 60. It was the Headquarters of the SS management in Budapest at the time. 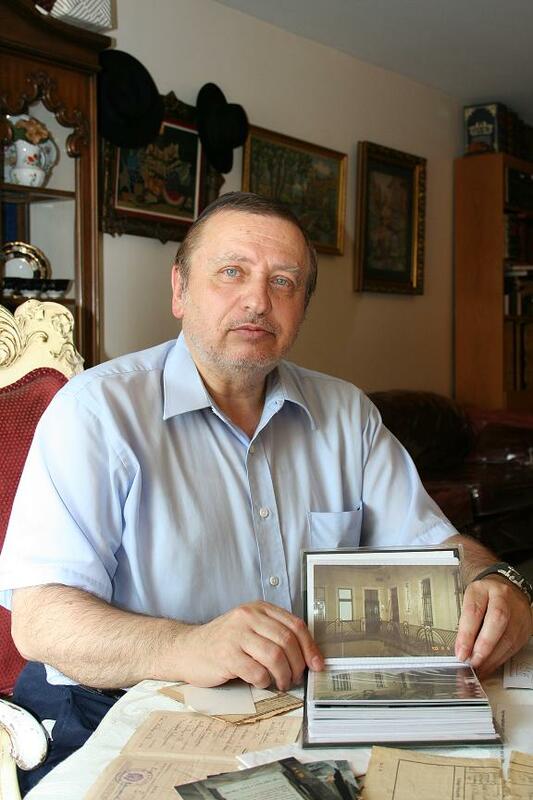 That was a place where a Jew was entered… it was almost unheard that he should walk out of there alive. It seems that my father had some righteous instinct, God helped him, and as soon as they got there, there was an air raid. All the Germans and Hungarians ran to the shelter. And my father and this other person walked out. They took a broom, or a shovel, and made believe they were shoveling the snow, and they walked out and returned home. This was on a Friday night – Saturday during the day, the officer came back. He told the superintendent, ”I forgot my white gloves, and I’m coming to pick them up.” My mother saw, and obviously got scared. I forgot to mention that all the way from our apartment, I would say, it was a good mile. Anyway, the two enlisted Hungarians were beating my father with sticks non-stop, and my father came home that night. My mother saw that he was blown up; and that his head was unimaginably altered… so this officer comes in and my mother got scared so he tells my mother, ”Don’t be afraid. In civilian life I am a doctor. I came here to see what’s happened to your husband. I’m not here in any official capacity to harm him, I’m here to heal him.” He looked at my father’s wounds, and then my mother asked, ”Tell me, who are you?” and he says, ”Don’t ask.” And he disappeared. He could have been Jewish, German, or a Good Samaritan. This must have been early November of 1944. They received a schutz-pass, which was the Swedish protectorate paper, and soon after that and in mid-November is the time when they entered the Swedish protectorate house. Q: Did your parents meet Raoul Wallenberg? A: My father said that he saw him once, I think. Once he came to this protectorate house, but one-on-one I don’t think my father ever… no. Q: Did your father describe Raoul Wallenberg to you? A: Physically? No. He said he once met him, but…his physical appearance… no. There was something I discussed with my older sisters, as they were going from the apartment that we lived in, which was in the seventh circuit of Budapest. They went to the Swedish protectorate, this was, by that time a Jewish area, it wasn’t yet considered ghetto, but it was an area were Jews were allowed to live. They went out to a non-Jewish area, which became the Swedish protectorate house. This was quite a long walk from where they lived. A Jew at that time was not allowed to be on the street, not to be outside of the area, and my sisters were young kids, as I said before – 6 and 4. And they were hanging on to the carriage that my mother was pushing with the one month old. They were trying to go to different places, but they were told, ”you can’t go here, you can’t go there”. My father knew Budapest like the palm of his hands, but there was no way of going. It’s not a question of he didn’t know where he was going. He knew the direction, except there wasn’t any permission and they stopped him. My sister told me, they stopped them in one place, and there was somebody who said, ”I will take care of them,” and he marched them. And eventually they got to this protectorate house. Once they arrived there, again I don’t have the exact date, but it was by mid-November to late-November of 1944. They went along with my older siblings, two sisters and one brother, two of my father’s brothers, a neighbor family from across the hall, and two young girls who were cousins of my father. This was the small group that got there. The building itself, where they went, once upon a time, before the war, must have been a luxurious apartment building for that time. But it was bombed… there were no windows, and some of the walls were left. It was cold and there wasn’t much warmth. They were in there for… 24 hours a day in whatever clothing they were able to have. They stayed there until a little after the liberation. Q: How did your parents obtain food and clothing while at the safe house? A: I would assume that clothing was only what they had from before, whatever they took with themselves. I have not heard anything about clothing, and food is something, which I inquired, my memory and the memory of my siblings that I talk to now, after, food… they don’t have a clear recollection that the Swedish Embassy brought in any food. I had some recollection my father saying that sometimes somebody from the Embassy brought in something. There were two things… as I mentioned before, I had two girl cousins that were there. One was a 12 or 13 years old girl who was able to pass as an Aryan and occasionally went out without the yellow star, and was able to secure something. And an original neighbor from our building, whom after the war I knew, his name was Schneider, and they also were able to [find food] and they risked their lives by going out. They were able to secure something. An interesting thing that happened, somewhere along the line they were able to secure beans. My mother cooked it or baked it, or whatever. There was no fire, what they did was, the broken pieces of the building that were the wooden beams, they made a fire. There was no gas. My mother ate those, and she was able to nurse my brother. He survived, and so that was the food… A major staple of food was that: beans. I don’t really know where they got it exactly, but somehow they got it and it was probably a major factor in their survival, as far as food is concerned. Clothing… as I said, I do not have any recollection of them talking about any new clothing… or, not new as ”new”, but newly acquired. Q: Did Raoul Wallenberg ever visit the safe house? A: Once my father saw him. But he saw other diplomats that came. Q: Do you know anything about the design and manufacture of the schutz-passes? A: My father had a friend, who is not with us anymore, Mr. Benedict. He was a year or two younger than my father, from the same hometown as him, and I met him here, my father was friendly with him. I was traveling once on a bus with him, and we were talking, so he tells me an interesting story. He says that he also had a schutz-pass, a Swedish schutz-pass, which at that time, they were very difficult to see. Thousands of people besieged the Swedish Embassy to get this thing. He came up with an idea, which is… flabbergasted me when he said it. He went up to the library, or the post office, he went up there and he saw the Swedish telephone book. He looked up somebody with the name ‘Benedict’. He found someone. He sent a telegram to that address, stating, ”I am Alfred,” I think that was his name…”I am the son of this-and-this Benedict, who is a brother of a cousin of your father.” And, ”I am stuck here in Hungary, and there is such a thing as a Swedish schutz-pass. Can you secure that for me and for my family?” He went up a few days later to the Swedish Embassy, where people were trying to get this schutz-pass, which was very limited. And so he goes up, and identifies himself as ‘Benedict’, and there is a schutz-pass written up for him, with instruction from this Mr. Benedict in Stockholm. And he got it without any fighting, without any standing in line. So, if you’re talking about Wallenberg as humanitarian, there were other Swedish people who did the same thing. I mean, this person did not risk his life, but he went out of his way to save a fellow man. And he said he knew it all along, and he did it as a humanitarian. Which, I don’t know if any similar stories are in your records or not, but it’s something which I tell many people. It should never come to it that people should need these types of different ideas, but it’s a tremendous idea. My parents went back [to the apartment], after the liberation, which was naturally ransacked. Not necessarily ransacked, but it was a small apartment, and it became the ghetto, and there must have been a hundred people living in those small apartments. And what they did… they needed heat; they took the furniture and burned the wood. So, a lot of things were missing. And they picked up their life after that. They survived. There was no food after the war either, and my father…there was a Swiss chocolate factory, and somehow they got hit, and they were able to remove blocks of chocolate and that became my father’s way of bartering for everything. With a piece of chocolate he was able to secure some flour, some wood. My father and his brothers were able to put their hands on something and that became their bartering tool. For food, for whatever they needed, for the early period after the war. It was something miraculous that my brother survived. He was a preemie, and there was no food, as I said before my mother was able to nurse… The family was together practically…well, other family members were killed, but the immediate family was together. They survived, and they built up a new life after the war. We stayed… I was born in 1946, and we stayed there till late 1956 when Hungary became a Communist country, that way we were unable to leave the country, and 1956 when the revolution against the Russians took place there was a possibility of leaving illegally, and that’s what we did. Crossed the border illegally, and we came to Austria and from there eventually we came to the United States. Q: On the outskirts of Budapest, there was a death camp in a mason factory. Do you know anything about this? A: Yes, there was. Going back a little bit, in the Swedish protectorate house, where my family was there, by my calculation roughly two months, from late November to late January… when Pest was liberated. You understand, Budapest is a city made up of Buda and Pest. Pest is the eastern part, and Buda is the western part, separated by the Danube River. And the Russians liberated Pest, but they had a tough time crossing the river, because the Germans, the retreating Germans bombed all the bridges. So in order to cross the Danube, they had to put up bridges, and it took them about a month before they were able to cross. So this was in Budapest… in Pest… and they were liberated in January. Buda was only liberated in February. During those two months, as I mentioned before, these protectorate houses, and these protectorate certificates, were just as good as the Hungarian-German officials accepted. I know of at least once, but I think twice, that the Hungarian Arrow Cross, which is the Hungarian SS, came into the protectorate house. They ordered all the occupants to line up, and they were taking them to the Danube to be shot. This was a time when deportation was impossible for them, because the railroad to the death camps was broken, so what they did, the Hungarians, was that they took Jews… marched them to the Danube, lined them up, and shot them. The same thing was at least once, but I think twice to my family. My father said somebody from the Swedish Embassy came and arranged to pull them off, and they were not taken to the Danube. There were others who were taken, even from the protectorate house. The Hungarian SS came in and did take them out and kill them. So it was a protection, but not a full protection. So this was what transpired there and this is how they survived. Q: Were those rescued by, or who worked with, Raoul Wallenberg all Jewish? A: If he had any Hungarian Gentiles…To the best of my knowledge I don’t know… it was all Jewish people. Q: Do you know what happened to Raoul Wallenberg after the war? A: That is a major question. I know as much as what’s written. But as far as I know, he went to meet the Russian Commandant and that was the last time he was heard of. There are all kinds of rumors, and I know as much as anybody who wants to read or study. I have an interesting theory on that. I don’t know if you’re familiar, in Slovakia there was a major worker for the Jewish cause, a Rabbi Weitzman. He was legendary, what he did… he was a Jew; he had held meetings with the highest officials of the SS. He wrote books after the war, and he was a tremendous head… genius. In everything else, not just… and he improvised. He kept, and he was able to, if you’re familiar with that, in Slovakia there were two deportations. One in 1941 and one in 1945. No, 1944, I’m sorry. Late 1944. But there was no deportation between 1941 to 1944. A major component of that was this Rabbi Weitzman. He worked ceaselessly, unbelievably, for saving the Jews. He came up with ideas, which is all documented, it’s all written about on how to save, and how to delay, and who to talk to, and how to talk to. 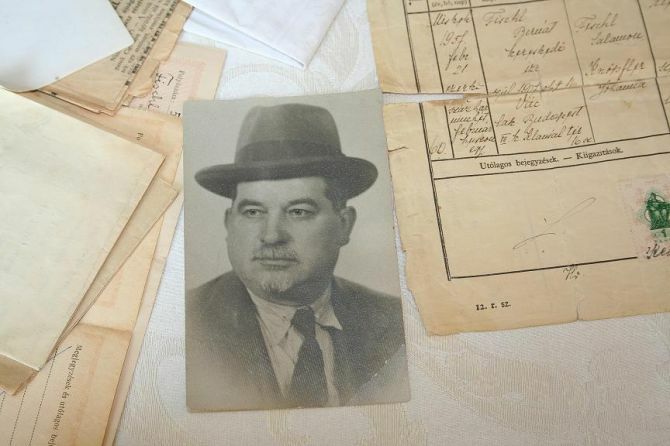 It was interesting; he jumped off the wagon taking him to Auschwitz and made his way back to Bratislava…it’s the capital of Slovakia today and he made his way back there and hid in a bunker. The Russians were right there, to liberate Bratislava. This man, with a small group of people from that bunker, made a deal with a German officer. He was taken by German officers to Switzerland, the distance from Bratislava to Switzerland is huge, I can’t tell you the mileage, but… they had to go through part of Austria, the whole width of Germany, in order to reach Switzerland. My guess would be definitely 300 to 500 miles. Here is a man who knew that the Russians are here, he is in a bunker, and the chances are that he can survive until the Russians come, he lets himself… okay, there was bribery, there was trickery, everything for these German officers to save him. But it’s still German officers, who pledged their lives. He allowed himself to be there, instead of waiting days, maybe less than days, to be saved by the Russians. He didn’t trust them. And I think that, obviously, he made the right move. They survived and he made it to Switzerland. Raoul Wallenberg was an honest man who believed that the Russians are liberating the Jews. He did not have the same fear of the Russians as this Rabbi Weitzman and he trusted them, and we see what probably transpired. But this is something which is, as I said before, I dabble in amateur history of this era. I talk to people; I love to talk to people. I read books, but every book, even if I know the author of the book…it’s still a book that was written down for mass distribution in an appeal to sell that book. I like to speak to people that were there, one on one, I can ask a question, I can have a communication… And I did, in many cases, had conversations with… as I said before, with this Mr. Benedict, and I don’t know whoever he told, if it got into any public forum or not, I don’t know. I have other stories, not necessarily related to Wallenberg, which are probably very rare or not written about. Q: What happened to your family after the war? A: My parents went back to their own apartment. And they were able to somehow secure food. My father was dealing with some Russian officers. The Russians, as I said, they were barbarians. The average Russian soldier at that time was a barbarian. Many of them were illiterate, starved and hungry, in war for 4 or 5 years. They were… it’s an old fact…but they attacked women. They did not care. The officers, obviously, were of a better breed. Some of them were… they had some Jewish officers too, who spoke Yiddish, were able to communicate with the Jewish population. My father had some dealing with a Jewish officer, who was dealing with him, as I said, in bartering food, and the Russians… this is an old story, they were crazy about watches. They had no watch. Russia at that time was way behind, to the best of my knowledge. They were crazy about watches, and they were trading with everybody, they saw someone with a watch they grabbed it and they took it and the ones who were decent they gave you something for it. And they were so foolish, when they had this big alarm clock, this is big watch, they say, ”Give me 10 small ones!”. So that was at the beginning, there was no industry at the time yet, so they lived on that. My father also was able to find some things, which he had. As I was saying, he was involved in shirts and uniforms, so he had some raw material, which was also in demand because there was no clothing. So he was able to barter for that also. Eventually life became somewhat standardized, and I can’t tell you exactly, I wasn’t there, but they were liberated in January of 1945, and I would assume by the time I was born in 1946, there was a certain normalcy for that era. In the way of bringing food, or getting food, and earning a living. Q: How did the war affect your parents’ religion? A: Obviously, my parents stayed together and they remained. You had people returning from concentration camps, who went through hell, one year, two years, three years of living subhuman life, who hadn’t at that time. You had this syndrome that you had later on in Vietnam, the prisoners, they treated them like dogs. Life meant nothing to the Germans. So they came back, obviously their religion was lax… or, they didn’t believe in anything. Many of them, after awhile, did return to it. But as far as my parents were concerned, they remained pretty stable, because they were able to. But that’s because of my parents’ situation, where they were. But these people, especially young people, who were separated from their parents, parents were killed, went to the concentration camp, they were 15, 17 years old. They lived for a year or two in slavery where every day was killing and a crematorium, and they came back… in retrospect, the humanity was lost for them. Only for a period of time. Q: What was the longest period of time that your parents were separated? A: I would say not long. Only that period that my father was in Serbia, which I don’t have a figure, but it must have been a couple of months. Q: How did the war affect your relationship with your parents? A: My sister asked my mother, ”How did you survive?” what was it that made people, that were dying left and right, hunger, murder everything. My mother said, ”I only live for the day”. Over here we are making plans, education for our children, for our grandchildren, we are making plans for our 401ks, and this and that. There was no such thing, the only thing there was, was a survival for the day… survival for the children. It obviously had a tremendous impact; they were thinking about it. I know many people would not speak about it for years. My parents, well I never directly asked them a lot, my mother a little bit and my father whenever he opened up, but I never really interrogated my father into what it was. Occasionally he would speak of things but most of the things he spoke of were the religious aspects to… never give up hope, there is a God, and he his watching over us, we don’t know his methods, we don’t know what he is doing… but whoever was destined whoever wanted to survived. As I said, they were lined up to be taken to the Danube; they were there already the last minute and they were called. They were right next to the Danube, if they were to be called they were probably a quarter of a mile to the Danube or less so they were taken out and it was finished. Its not something that could have been saved… it was pure luck or God’s help. So this is something that they lived with all there lives and my father spoke very rarely, and the main thing that he spoke and explained to us about was to have faith… there is a God, we don’t know what he is doing… there are many cases and the last minute he survived. My father, rest in peace, was a very peaceful, very righteous man, let me tell you a story. My father had a doctor who had a potion and if you inject the person with the potion, it made the person yellow, and it [looked like it was] very contagious. The Germans and the Hungarians were very afraid of it, if they saw someone they isolated them, they threw them out, if there was a concentration of Jews and someone was yellow they would kick them out. So it was a way out. Obviously this was poison and it was strong. My father got hold of this from the start, and he had some sort of percentage in which he shot many people with it, and I don’t know the number… if it was 5, 10, 15… I don’t know too many, and he did that and he saved people’s lives. My father never told this story, my mother did. When my father was working at the airport it wasn’t an 8-hour work shift it was an 18 hr work shift. In order to get to and from work he put in probably more work also with that. So that day, when he came home knocked out there was just a person sitting there and his son was taken into a place where most of them were killed. My father came home as knocked out as a person could possibly be and my mother said that this man said that you have to come and administer this potion to his son or then they will ship out his son. Then my mother said to the man, ”Please, let him eat”… but my father said, ”no, I have to save him” and my father went… it wasn’t to far from the neighborhood… and he did that and the kid was thrown out and survived. The man came to my father’s home and said to him that because of him his son was alive. That was one story. In Slovakia the deportation was in 1941, they took a big chunk of the gypsies there… From 1941 to 1944 there was a hiatus, the Slovakian people spoke Hungarian because Slovakia was next to the border with Hungary. Most of those people closer to Hungary spoke Hungarian, many of those young people escaped. A man that escaped from Slovakia went to relatives and said, ”can I please sleep here? I have nowhere to go” and the other man said, ”No, you cant, I can not risk my family”… They did come, you know, in the middle of the night the police came check papers. Despite the small house that we use to live in, he slept there many nights, refugees and other illegal… and my father took the possibilities and he brought them out food and he gave them anything they wanted and this was before Wallenberg. This is what my father did; they always say nice things about my father, always risking his life to save others. Q: How do you feel about Raoul Wallenberg? A: Very thankful, and obviously I am here because of him and so are my siblings and only because of him. He was a young person who came from a rich family and risked his life to save others and it’s a pity. It is crazy how today there is no way to try to locate him in. Q: What would you say to him if he were here with us today? A: I would thank him in any possible way. He gave me my life and as far as history says he had no particular reason to do it, only for humanitarian reasons. It’s not a question that he had no connections. He did a beautiful thing, came from a well-careered family and for no other reason… just to save lives. Q: What do you think that Raoul Wallenberg would say to you and to the world? A: Great people like this would say, ”I would do it again.” I would say that he would probably say, ”It’s still worth it.” What did the Russians want from him? Obviously Wallenberg had outside help, and had connections to foreign money, to Jewish estates and to U.S. and maybe the C.I.A. According to the legend he had abundance of money to buy his houses and he was bribing everybody. So this was a man who would be able to do it and even when Eichmann said, ”that diplomats even have car accidents”… that didn’t stop him. We are talking about a person who was willing to do it, and he did it.